Life got fast, real quick! At the moment I am at the beginning of a two month long tour working for Andrew McMahon in the Wilderness on the Panic at the Disco & Weezer summer tour! We have about five shows under our belt now, but before I post pictures from the tour I wanted to show you what I have shot leading up to it. Here are some of my favorites from the week prior. Before heading out to Los Angeles to rehearse with Andrew McMahon, Say Anything came through Nashville. I've toured with them in the past, so it was such a pleasure to shoot them in my town. MewithoutYou supported Say Anything and I got a few good shots of them too. My best friend Matt was also in town tour managing for Say Anything, so I was able to snap a few pictures of him, Audrey, and their beautiful daughter Lily. I flew back out to Los Angeles to rehearse for BottleRock, a three day festival in Napa Valley, California. Andrew McMahon in the wilderness played the last day of the festival. It was beautiful weather, and the turnout was awesome. Above is Andrew's daughter, Cecilia. She loves watching her dad on stage. I had the time to shoot a few other bands at BottleRock, including X Ambassadors. Red Hot Chili Peppers headlined the festival, and I saw their drummer Chad Smith walk by backstage. I couldn't resist asking him if I could take his picture. He said "I don't know, can you? I'm just a guy walking." I said "Yes I can!" He smirked, as I took his picture. You can see my reflection in his glasses! I also shot Misterwives, a high energy funk-pop band with a front woman who kills it. I love them! I walked the festival grounds after the show cleared, and shot the aftermath. I met Ojha, who had been a bartender all weekend at this tiny bar, directly in front of the main stage in the middle of the crowds. He was high on the energy of the past three days still, and was singing Red Hot Chili Peppers songs out loud as he packed up his bar. Magic the dog and Andrew McMahon's booking agent, partying hard. After BottleRock festival I stayed in Los Angeles with some friends for a week. We did a little hike in Orange County and I took some fun pictures with my flash. I spent four more days doing production rehearsals for the Panic at the Disco & Weezer tour in Los Angeles. Here are some process shots of the prep work involved. 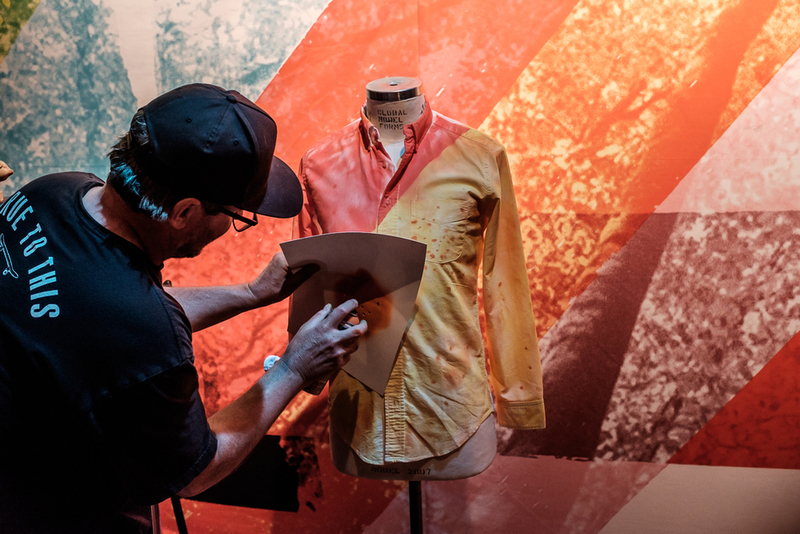 Josh used special paints to recreate the backdrop pattern on the band members show clothes. He also designs all of the board shorts for Volcom. 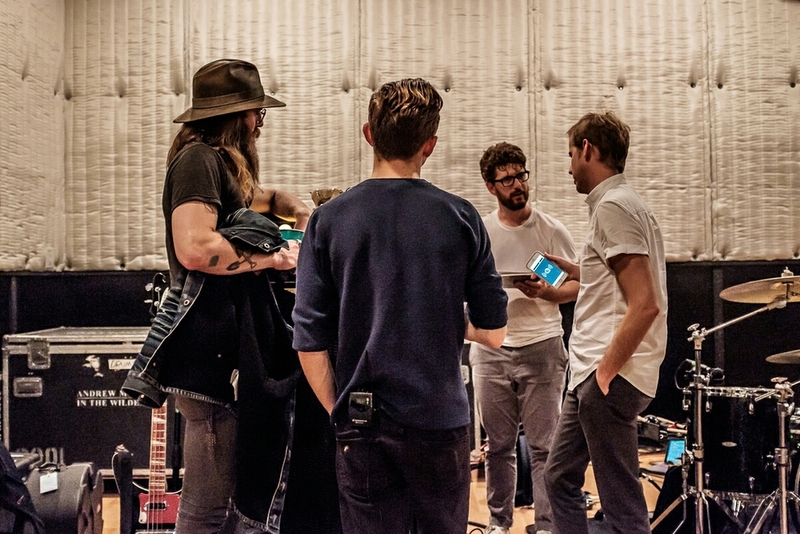 The band discusses the arrangments of a new song they will play on the tour.